Fresh cold pouring in through the North Sea on the back of an area of low-pressure will help deliver more significant snow to the mountain areas of Central Europe. Particularly the north facing Alpine regions. On Tuesday and Wednesday these areas are increasingly affected by the next disturbances. There is also a fair amount of fresh snow this time for the French Alps and western Switzerland. On Monday, it is still snowing most of the times with light to moderate snow fall in the northern and central Alps, 5 to 20 cm are to be expected until Tuesday morning. After a brief calming down on Tuesday morning, the next fronts arrive with snowfall from the north, first a warm front followed closely by a cold front. It is a classic Nordweststau and the most precipitation is forecasted for the Eastern Alps. The snow line that initially lies between 500 and 800 meters drops in the afternoon -with the inflow of additional cold air- to just below 300 meters; even in the french Alps. South of the main ridge, only a little fresh snow is coming in. On Wednesday it continues to snow north of the main ridge. The Bernese High Alps join in on the party, in the Southern Alps dry weather prevails accompanied by strong NW wind. On Thursday, fading snow showers linger on the eastern side of the Alps. In general 15cm for eastern Austria, with the Dachstein area welcoming 30 cm. Friday is one again a cloudy with only a few snowflakes, also in the Southern Alps a lot of clouds, only on the southern edge of the Alps quite sunny, generally quite icy. Between Wednesday and Friday 60cm in the valleys and 120m of fresh snow in the mountains is expected in Tirol, mostly in areas already worst affected: Kitzbühel Alps (Pass Thurn, Gerlos, Hochfilzen), the Karwendel, the Lechtal Alps and in the Arlberg-Paznaun area. During the weekend another weather front passes the northern Alps. In combination with heavy wind in the mountains, it is likely that during the week the avalanche danger rises from level four to the highest level five, so "very large". The state of Tyrol has already made arrangements for emergencies. The head of the avalanche warning service in Tyrol, Rudi Mair, is extremely worried: "Unfortunately, it looks like it will snow again, especially on the weekend". If we look further ahead the snow keeps coming for the areas North of the main ridge. Is there something as to much snow? 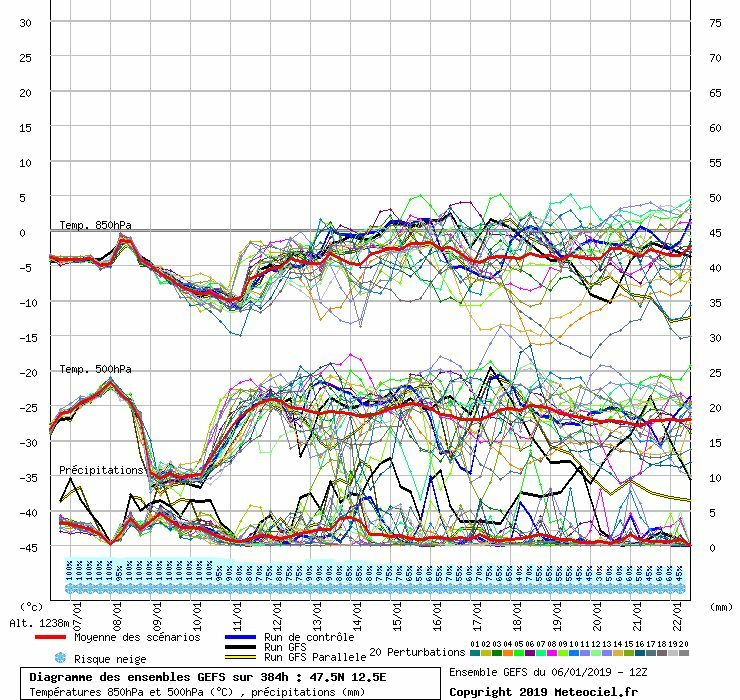 The western Alps will finally get a decent fresh snow cover.